Fat Piggy, Happy Piggy | Ai.Me.Be. I got off my plane from Jamaica in Charlotte and instead of continuing to Phoenix, my best friend’s little brother Curt was so kind to drive me halfway to Richmond where my sister Kristie scooped me up and we continued the drive to New Jersey for our Grandma’s funeral. Then afterward we found ourselves at her house confronted with, what’s next..? It’s a crazy experience to suddenly be going through her things, and she is just gone, with no real goodbye. And we don’t even feel like we can really take our time because we all have flights back home and schedules to rush back to, and Dr. appointments and now her house to sell… One of my nieces asks “Are we stealing?” and my Mom explains what inheritance means.. We all pick a few things that have meaning to us and will remind us of Grandma. Little Evan is so cute, he picks the one item that I was probably 100% sure would still be there for the estate sale, a delicate shoe with 2 candles coming out of it that we would see in her hallway every time you walked upstairs. Here is a pic Jen sent a couple weeks later of Evan playing with his shoe. 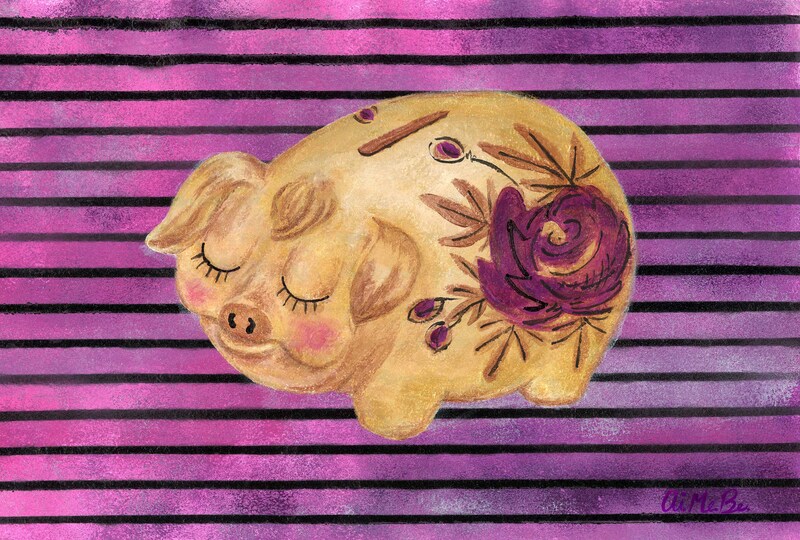 This cute piggy bank is quintessential Grandma and she makes me smile. Her home was Gram’s spare bedroom that used to be my Mom’s room. Fine, delicate, beautiful.. a reminder to be frugal and live well.. As we say nowadays, Grandma worked hard and played hard. Retiring at 88 yrs. old, I remember her going on many family trips with us, and also jetting off with her traveling friends on different cruises around the world. A strong independent woman, an inspiration, a loving & caring soul. We miss you Grandma! Aimee, I still remember Evan and that Shoe. I love that picture you painted and it does remind me of Grandma. Thank you Laura. One of the candles has broken so they need to find another that will fit! So sorry for your loss, Aimee. Thank you for sharing such delicate memories. The things we like to keep in memory of those we love is so often the simplest. Blessings for the New Year! Thank you DM. Good to hear from you again. Blessings in this New Year to you as well!